I received this teal cardigan from Stitch Fix four years ago and I never really wore it that much. I always liked it. It's a very pretty color, has a unique knotted design on the back, and it's thin....always a plus for me as chunky knits add to much bulk to my frame. Despite all those positive characteristics of the cardigan, I never wore it much because I found the color somewhat limiting. As every season comes to a close, I like to go through my closet and wear something that hasn't been worn yet. I want to make sure everything gets worn at least once before the season ends! I thought I was the only odd bird that did that, but my good blogging friend The Pouting Pensioner does the same thing! Well, this cardigan had not been worn yet, so out it came! But now for the real problem. How do I style it? My favorite place to go for style inspiration is Pinterest. So I typed in the search box "What to wear with a teal cardigan?" and a lot of options came up; most of which I pinned to my Winter Fashion Board. Teal with white and silver. I thought it was interesting that all three looks incorporated a coordinating teal scarf, which to my surprise I did not have in my mega huge collection of scarves. I will have to remember to keep an eye out for one while shopping. In the meantime, one of my own scarves that has more orange than teal in it will have to do. Even though I liked all three looks that I pinned, I went with the beige option because I had already worn the cardigan with black (see last picture in post). My beige under-piece is an old ribbed tank from Walmart. I wore this outfit to church. It's still chilly here with snow on the ground. 😢 I thought this was a nice look for this time of the year because the cardigan and scarf are warm, yet the purse, scarf, and cardigan add some much needed color when there's not much color outside. The bag is from London Fog and was a gift from my daughter (old). And now that I think of it, the scarf was too! The back of this cardigan has a unique knotted feature, and I love the cut too! For jewelry, I wore a green stone ring and a bracelet with teals, blues, and browns in it. Here is a close-up of the scarf so you can see there is indeed some teal in it! I wore taupe suede booties (old, Famous Footwear). My jeans are from Charlotte Russe (sold out on-line, check your local store). I love the released hem detail. And finally, here is that same cardigan worn with a black tank and black faux leather leggings. Well firstly, thanks for the mention, that was a surprise to read! Your teal cardi is a lovely colour but I guess we do shy away from the challenges these colours bring (hence panic-wearing at the end of the season!). Pinterest is such a useful source for inspo when stuck - I tend to save inspos on my kindle but I've started using my Pinterest account more recently, because it can be challenging to save Pinterest images elsewhere. Anyway, I've digressed, back to teal! I've been spookily searching it on Pinterest recently for decor ideas, have you thought to try that to pick up some fabulous colour ideas generally? You look super-cute in your black column, always a winner. Have you thought about wearing it in spring with white and beige columns? And if you get yourself a multicoloured scarf with teal in it then you'll be on a roll, as the scarf will link the cardi into just about everything and you will be one happy bunny!!! Hugs and have yourself a good weekend, x.
haha! Glad you got a kick out of it. I really did think I was the only woman who did this. I like to wear everything at least once, because you know what they say "If you haven't worn it in a year, get rid of it". And I don't want to get rid of it, so I wear it! I love your ideas! I especially love the idea of wearing this teal cardigan with an all white column. It will be perfect for spring, especially since it's a thin cardigan! I love the color teal in clothing. This cardigan looks great on you, love how you dressed it up with the scarf. I've had my thin teal cardigan for a few years now and I do love wearing it. Just can't wear it much in the winter months, because it's a little bit longer than my coat. Love the detail on the back yours, so pretty! Thank Elli! Isn't that the truth about most cardigans? I find I wear them more in the spring and fall than I do in the winter. They just don't fit well under coats. I think this turned out perfect...I love the teal with the orange (or is is red?)!! I used to have a ton of teal, and my favorite is to pair it with pink!! It's kinda like pink and green!! Have a wonderful weekend Amy!! Thanks Jodie! The scarf is a mix of colors: teal, reds, oranges. I like the pink idea! I will have to try that! Gorgeous. What interesting detailing on the back of your cardi. Beautiful peacock color, too. Love the scarf and bag with it. But best of all, the fit on your jeans. Girlfriend, you are rocking that denim! Thanks Leslie! I just had to bite the bullet and buy three new pair of jeans because all my old jeans weren't fitting me well anymore. I don't have much of this color either. It looks so great on you though. Great inspiration. That teal cardigan is really pretty! 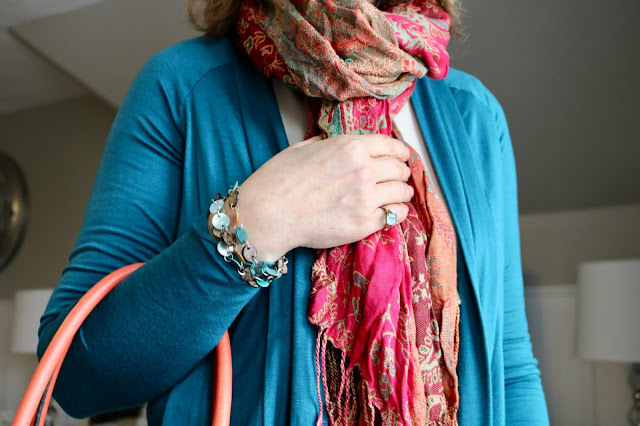 I honestly love your bright scarf with the teal cardi more than the pinterest inspirations!It looks great and I hope you're able to wear it more! I just love the back side of this cardi, it is so unique. I love how Stitch Fix pieces always have nice details like that. I love how you styled the cardi with a pop of color with your scarf and bag! I found it interesting that all of the pinned outfits styled it with a teal scarf. Thanks Carrie! Stitch Fix always does have those unique details in their clothes, don't they? And yes about the scarves too! I just wish I could find a scarf with these colors in them. So many great ways to wear teal! I think my favorite combo is teal and taupe or tan it warms it up! Thanks Brooke! My favorite too, that's why I chose that one! I like both ways beige and the black. I think teal is a hard color to wear depending on the shade. Thanks Victoria! It is a hard color to style. I think you styled it beautifully! I love the scarf and the color is stunning on you. I can see this worn in almost any season. Thanks Kathrine! I always thought of this as a fall or winter cardigan, but after reading some suggestions of wearing it with white, I can see wearing it in the spring too. That is a lovely cardigan! I really like the orange scarf with it too! :) Glad you could get inspired and think of some ways to wear it! I try make sure I wear everything but my wardrobe is so disorganised I can quickly lose track of things - I'm hoping we get a new place with a bigger wardrobe soon, haha! Thanks Mica! It seems the orange scarf was more popular than the teal ones: I guess it's a good thing I didn't have a teal scarf. Good luck on finding a new home. I love a colored cardigan like this one. 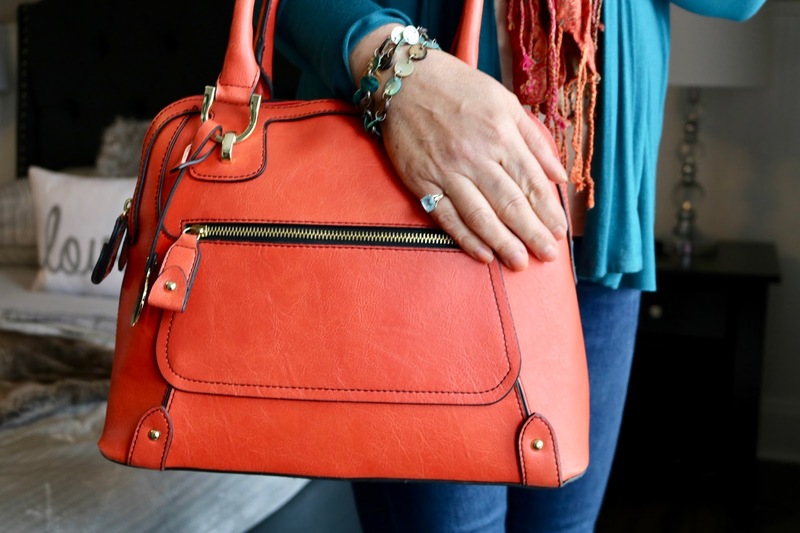 And that pop of color with that bag is SO good too! I'm glad you found those pins. I've struggled with teal too but when put through its paces it's great . It suits you. It's in my pallet too. Funnily I put a teal cardi out for donation and this very morning changed my mind to try again with it. I can use your ideas now can't i! Thanks Anna! I'm glad this post convinced you to keep your cardigan! I used to own two similar long, open cardigans which I loved but I don't know what happened to them. You styled your "forgotten piece" very well. I love the first Pinterest outfit very much too. Pinterest is so fun! So many ideas and cute things to scroll through. 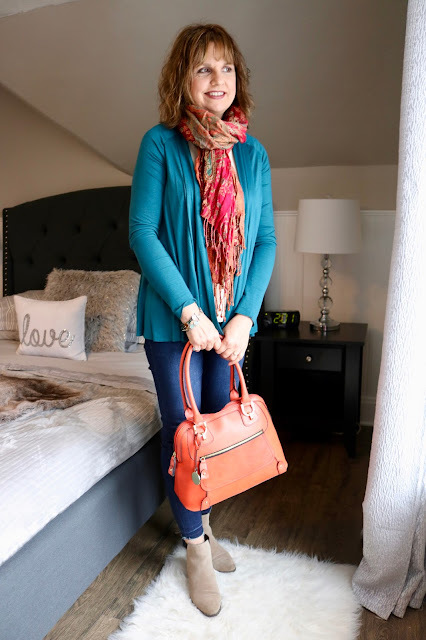 I love how you styled your teal cardigan and paired it with orange scarf and bag. The color combo is actually gorgeous. The knot on the back of your cardigan is unique and love that it brings in the waist a bit. A lot of the times cardigans are free flowy and boxy. Thanks Maureen, it's amazing what happens by "accident". I wanted to create the Pinterest looks exactly, but when I had to use what I already had, it turned out better I think. You look so great in real, Amy! I think this is one of my favorite outfits of yours! Have a fun Wednesday! definitely one of my favorite colors! i love teal - loving how you paired it up with more orange/coral tones too! It's such a cool and calming color, and yes, it definitely looks great with your scarf dear. Such a lovely contrast. Pinterest always has the best suggestions. I love the pairing of teal and orange. This look is beautiful!